It’s a little past the half way point in October, and everybody seems to be catching NaNoFever. All the blogs that I’m subscribed to keep talking about how they’re prepping for it and making outlines and character sketches, so it’s making me want to talk about it. But… this year will be different. The first time I tried NaNoWriMo was in 2010. At that time, I was taking a creative writing class in high school, and I’d overheard some students who were a grade above me talk about it. And so I wanted to try it. However, I started five days late, and couldn’t catch up to the amount of words I needed to write per day to finish. So I ultimately quit. Then I tried NaNoWriMo again in 2011, which was also a bust, because I had college applications to fill out and stress over. Spreading NaNoWriMo over that sandwich of doom wasn’t going to help me. Fast forward to 2012, and not only did I participate with a fellow writer friend living in the same dorm as me. I won it, too. And that year, I came prepared. I had an idea of what to write about each of the thirty days. I knew what word count I had to make each day. I was fully willing and able to do this, and my class schedule didn’t pose that much of a problem. And I won it in 2013, too. With sixteen units of classes in the fall quarter. And even then, I didn’t have a plan. I was a member of the club I’m running now, and they were doing NaNoWriMo too, so it felt very communal, that I was a part of a larger thing. And now, we reach 2014. The year I’ve decided I’m not doing NaNoWriMo. This is because for the most part, I’ve been focusing on re-reading my books on writing craft to get better. And I’m in my junior year of college. And I’m the president of a club, and the associate editor for one of my college’s undergraduate literary magazines. And the readings for my classes are fast and many. And I’m also planning to apply to a study abroad program in Japan. In short, I’m busy. I’m taking on a lot. And that’s okay. Because most of that is new and exciting and will help me to become a better person in the future. For those of you who’ve done NaNoWriMo in the past, and want to do it this year, but find that you’re busier than ever, like me, it’s okay if you don’t want to do it. You don’t have to do it. Nothing says that as a writer, you’re required to do it each year. I’m pretty sure plenty of writers out there, among the seven billion or so people in the world, don’t do NaNoWriMo, published or not. Not doing NaNoWriMo this year doesn’t make you, or me, less of a writer. Being a writer is something deep in your bones. An itch you can’t get away from. The inner child that loves to scribble words into fanciful images. It is something that, beyond the shadow of a doubt, you will become if you keep at it. The purpose of NaNoWriMo is not to make you suffer at the hands of writing. (It will make you suffer a little, regardless, and drink massive amounts of coffee or tea to keep you going, but that’s not my point.) The purpose of NaNoWriMo is to celebrate your writing—to love your writing and love yourself, as a result. But NaNoWriMo is a tough commitment. Getting yourself to sit down at your computer or with your journal, day in and day out, and get 50,000 words? That’s hard! If anybody tells you it isn’t hard, they’re lying. NaNoWriMo is for those who know that they have the time to write, but they’ve never made use of it. It’s for those who’ve said, “Oh, I’ll write that novel eventually,” and time passes by, and they never do it. But if you just don’t have the time–you’ve got two jobs, a family to raise, a Thanksgiving shindig to plan, a generally busy life—then don’t do it. And, yes. I sound like a pessimistic realist instead of an optimistic idealist. But writing should take one’s full attention and honest commitment. It’s why it’s a full-blown job for most people. 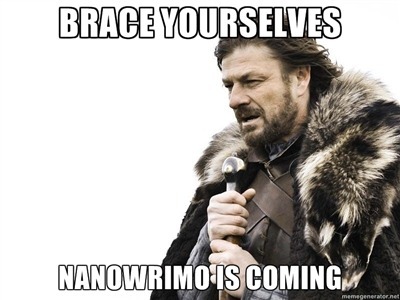 Don’t feel bad if you’re not doing NaNo this year. There’s always next year.